That cemeteries can be a place other than for eternal rest, mourning, and the occasional architecture tour is not unheard of, but the list of activities seem to be growing ever more varied and outlandish. 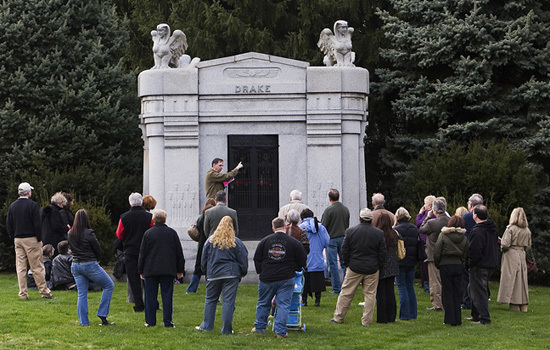 “Historic cemeteries, desperate for money to pay for badly needed restorations, are reaching out to the public in ever more unusual ways, with dog parades, bird-watching lectures, Sunday jazz concerts, brunches with star chefs, Halloween parties in the crematory and even a nudie calendar,” reports the New York Times. So if cities ever want to reactivate dead urban spaces, they need only put some dead bodies there, preferably of famous people, and in mausoleums designed by Rem Koolhaas and Ken Smith. Next year: wayward bones -- real Confederate ones or those deliberately buried there by organizers -- providing for scenes of hilarity.